Currently, most cultured fishes are fed through compound fish feed for economic and social benefits, as a consequence, fish taste and output, to a remarkable extent, are depended on the quality and production capacity of fish feed. According to the conclusion drawn by fish cultivation expert, within certain limits, the higher quality of fish feed and lower feed coefficient, the higher growth rate and yield of fish. Meanwhile, the higher feed conversion ratio, the less waste into the environment and the better water quality, all of which make health condition of fish better, decrease the disease risk of fish and lower the disease degree of fish, and finally enhance the meat quality and taste of fish. In general, the key factors that influence extruded fish feed quality and production capacity contain raw materials of fish feed, ingredients of raw material, feed formulation design, manufacturing process and feed producing machines. Additionally, the subsequent rationality of process design, conveyor operation, grease spraying control and cooling effect also affect the extruded aqua feed quality. In order to get eligible extruded fish feed, producers need to proceed overall administration and proceed from the whole fish feed production line situation, highly efficiently ensuring product quality stability in time. Fish feed raw materials, one of the primary factors of feed production quality control, have wide range of sources, complicated various component and great difference, mainly including protein feeding stuff, energy type feeding stuff, mineral substance feeding stuff and feed supplement. All the physical properties of raw materials, including volume weight, granularity, moisture and impurities content and so forth, can make the effect on extruded feed yield and quality. Volume weight: various materials have different volume weights. Usually, raw materials with small volume weight have high cellulose content that is adverse to extrusion, leading to small yield. Whereas, raw materials with big unit weight can absorb water much better for large output. Granularity: particle size has three types, coarse-, medium- and fine-size, and the latter two are easier to extrude. That is because larger surface area is in favor of heat and moisture absorption and easy for gelatinization, and when fineness of pulverization is fine, the density of materials will be large, hence promoting the quality and output of extruded fish feed. In a word briefly, the particle size distribution of feed should be basically even (without large size), so as to produce extruded feed with good appearance and quality and high production. Moisture: water content in raw material is closely related to fish feed quality, processing stability and extruding state within extrusion chamber. No matter moisture is too low or too high, energy consumption is so high that production is also down. Impurities content: too many impurities content in raw materials would have a strong impact on machine abrasion, so the less impurities content, the better. Fish feed formulation is the basis of how to add a variety of raw materials during the process of feed, so whether the formula design is scientific has a direct close relationship with the quality of fish feed. As the two main nutritive indexes of fish feed, the higher protein and fat content, the lower feed coefficient and the better to digest and absorb. However, extruded fish feeds with the same content also have greater differences due to different existential states and structures of feed active ingredient. Taking barley, oat and wheat for example, carp has diverse protein digestibility of these three grain feeds, obviously “barley is greater than oat while oat is greater than wheat” mainly because the protein quality of wheat is worse than that of barley and oat, namely, wheat has lower lysine and threonine content. On the contrary, if the necessary nutrient content of fish feed is too high, it would cause indigestion. For instance, even though protein content is too much, the protein storage in fish body is almost constant, that is, body weight increasing is not proportional to protein content in feed, which not only lead to waste of protein, but the generated metabolin would pollute water quality. Therefore, there should be a suitable ratio for various nutrient ingredients. The nutritional requirements of fish for feed have their own features. For example, fish can take full advantage of protein and fat in feed but they cannot make good use of carbohydrates and it’s hard for them to digest cellulose. Besides, different feeding habits of fish may need different nutrition. Hence, the extruded fish feed formulation should be adjusted according to fish feeding habits, and only when nutrient contents match with fish need, digestibility can be enhanced and feed coefficient can be lowered. Visit fish feed formulation for more information. Materials cleaning: before entering extruder, raw materials must be cleaned through screen and magnetic separation, cleaning metal, stone, clod and other impurities in materials, which can prevent equipment abrasion caused by impurities and increase extruded fish feed production and quality at the same time. 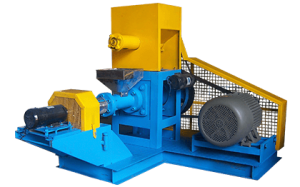 Materials crushing: some materials need to be crushed as certain granularity via fish feed crusher before entering extruder. As is well known, material’s surface area is depended on its particle size, the thinner granularity, the bigger surface area, and the faster water absorbing, assisting in promoting extruded feed quality and yield. 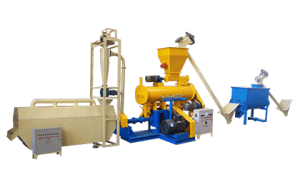 Flow of materials into machine: materials flow entering extruder must satisfy the extrusion need so as to make extruder work ceaselessly and evenly and make sure the quality of fish feed. If deficiency of materials feeding, extrusion effect is not ideal while if overmuch materials feeding, it’s easy to cause machine stoppage, leading to lowering of productivity or even burn down the fish feed extruder. Tempering: before entering the extrusion chamber, materials always need to be processed through steam and moisture, and this pretreatment process is known as tempering that can soften materials for higher plasticity and make materials past-forming for better cohesive action. The 3 factors affecting tempering system are tempering water, time and temperature. How much water added into tempering depends on how much water content that raw materials have after crushing but before entering conditioner, aiming at controlling water content at 19%-25% after tempering. Meanwhile, tempering temperature should be controlled over 95 degree Celsius and the recommended tempering time is 20-30 seconds. To produce superior fish feed, in addition to formula, materials and tempering, feed production machine – fish feed extruder structure design and operation is also quite important influencing factors. To be specific, the screw configuration plays a key role in feed quality, the die head structure should ensure fluid pressure smooth and uniform mixing after passing die head, the template decides the shape and size of materials and the slicer mainly has effect on feed appearance. 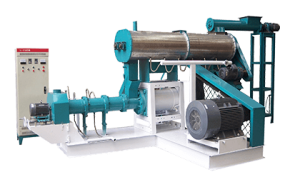 As the leading professional fish feed machine manufacturer, FANWAY suggests feed plants and fish farmers use the high performance fish feed extruder to produce fish feed. For large scale, choose the extruder with high production capacity, such as 1t/h, 2t/h or even 5t/h, while for small scale, low production capacity machine is better, including 180kg/h, 300kg/h or 500kg/h and so forth, all of which can make a difference on extruded fish feed yield. Overall, many factors affect the quality and production capacity of extruded fish feed, and there still will be unpredictable influence factors during producing process, so for the purpose of extruded aquatic feed with high quality and high yield, feed plants and fish farmers who produce feed by own must choose suitable raw materials, adopt scientific formula, lay emphasis on manufacturing process and use the most appropriate fish feed production machines.